WASHINGTON, DC -- On March 15, 2013, U.S. Rep. Hal Rogers (R-KY) joined several Congressional colleagues to introduce the Stop the Tampering of Prescription Pills (STOPP) Act. It requires commonly abused painkillers to be made with abuse-deterrent formulations. Without Food & Drug Administration (FDA) action or passage of the STOPP Act, generic, easily crushable opioids, like Opana and Oxycontin, are likely to return to medicine cabinets for potential abuse and misuse. 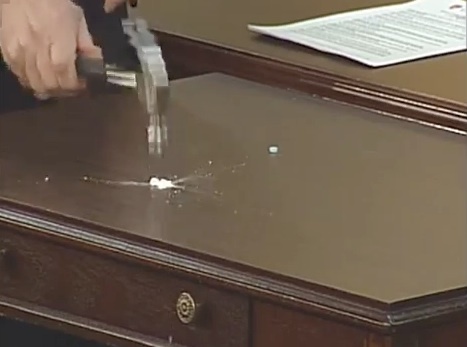 Click the photo to watch Congressman Keating's demonstration of drug abuse-deterrent technology. Click here to read more about the STOPP Act. Rogers joined with former Representative Mary Bono Mack to form the Congressional Caucus on Prescription Drug Abuse in 2009. Rogers has served Kentucky’s 5th Congressional District since 1981. With a focus on economic development, job creation, fighting illegal drugs and preserving Appalachia’s natural treasures, he has a reputation for listening to his constituents and fighting for the region he represents. 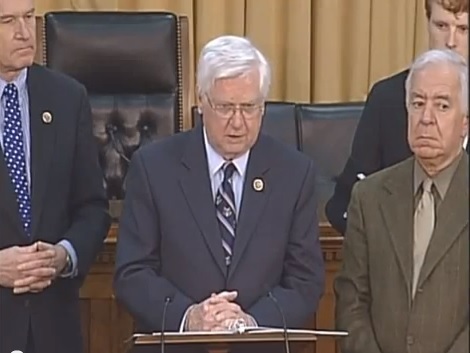 For more information, visit http://halrogers.house.gov/or follow Rogers on Twitter https://twitter.com/#!/RepHalRogers or on Facebook https://www.facebook.com/#!/CongressmanHalRogers.